It has been almost 2 weeks since I wrote about my problems with our oldest daughter. I have to say that just writing about it made me feel so much better, which encouraged me to actively address the problem instead of just worrying about it. I've decided to write a couple posts on how we're addressing the problems, changes that we're making, as well as a few tools and resources. Parenting is sometimes hard and I'm not afraid to say that I've made mistakes in the short time that I've been a mom. I am not a psychiatrist, a nutritionist, a doctor or any kind of professional. I'm just a mom afraid of watching my daughter slip away from me at a very young age. 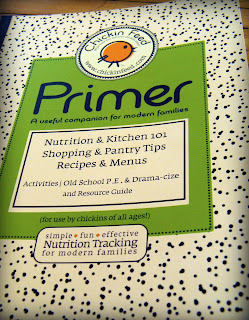 A couple hours after writing the post about Corrina, the Chickin Feed Primer almost literally fell at my feet when I was pulling a cookbook out of the cabinet. I had bought it a couple years ago (I honestly have no recollection of how I originally came across it or where I bought it) and I never really looked through it or bought the tracking boards that accompany it. 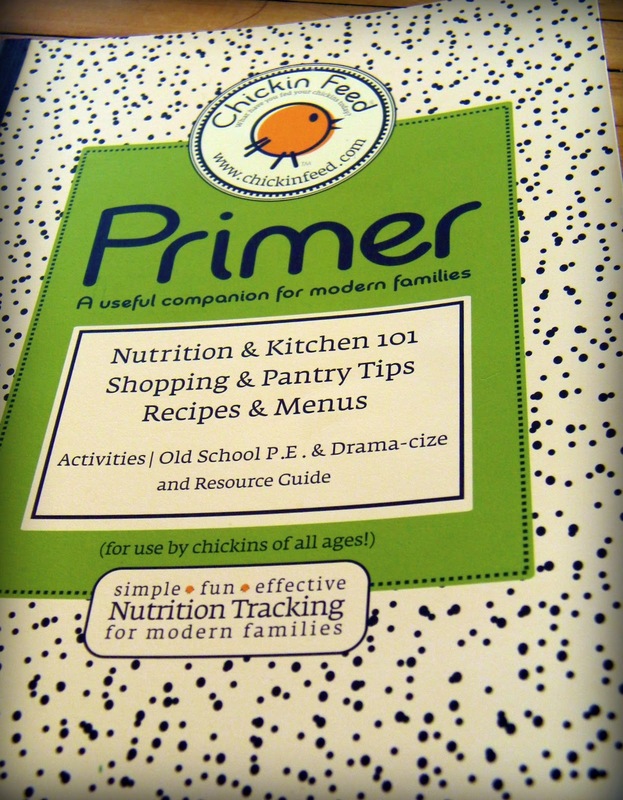 I opened it up and found a wealth of information on nutrition for children, what they need and how they get it, some really good kitchen and meal tips, recipes, exercises and activities for kids and a list of resources. 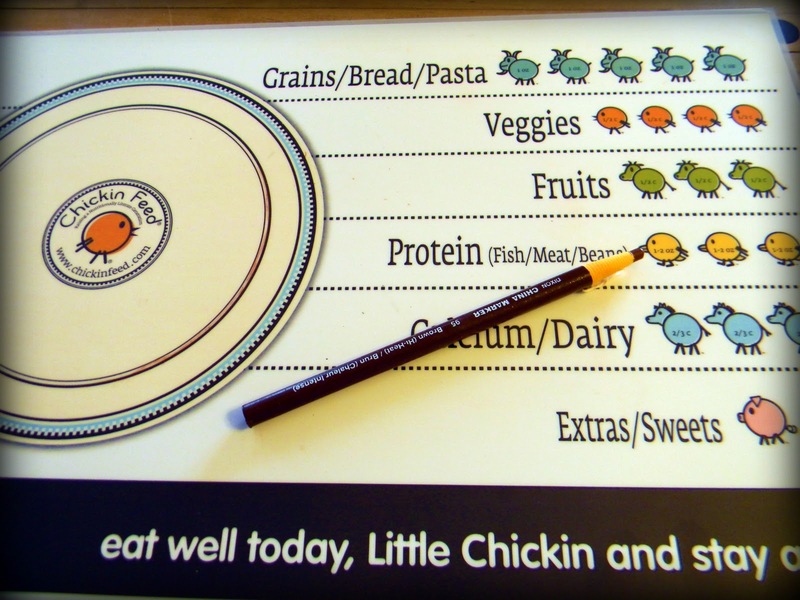 I knew that I needed help making some changes, so I ordered the Trackin' Place Mat. 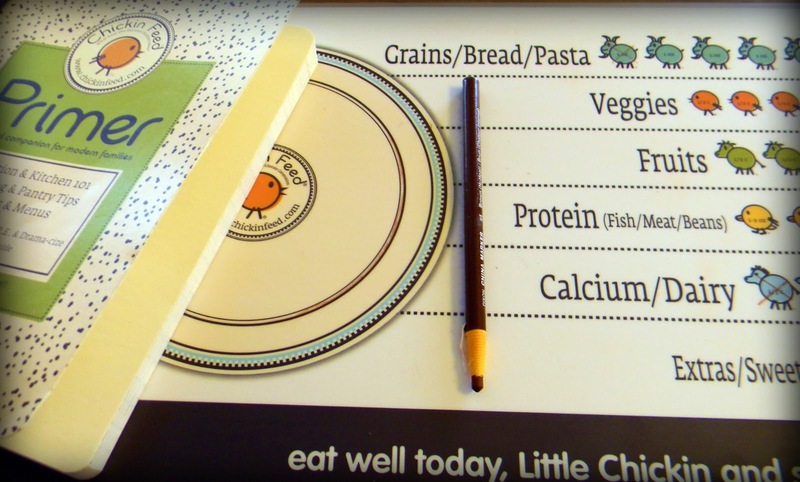 Apparently, when I bought the book, they carried a metal tracking board, complete with magnet trackers, which has evolved into the place mat (I really would rather have a magnet board, though). 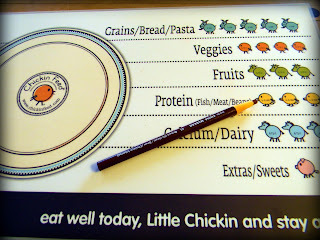 The mat is laminated and comes with a wax pencil that can be removed daily. 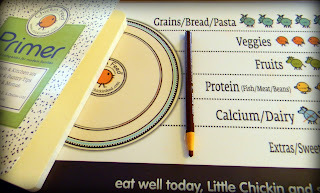 On one side, it shows the food groups, serving suggestions and daily amounts, which can be checked off as they are eaten. On the other side, there is an explanation of food groups and which foods fall into each group. I have to say that I can't believe how the amount of food I have been serving Corrina differs from the amounts she should have. I thought I was serving fairly balanced meals in good portions. Boy, was I wrong! I'm pretty sure I'm not the only person overfeeding my children. I don't know why I have never familiarized myself with the food pyramid and serving sizes. Isn't this my job as a parent? It has just never occurred to me. My eyes have been opened and I urge all parents to familiarize yourself with this information. I'm not saying that parents need to turn into the food police and only let our children eat exactly what is suggested and nothing more or less. We are being flexible, we realize that these are merely serving suggestions. It is not a law and obviously no one is going to show up on your doorstep to cart you away for not following exactly. This is not a diet, we're not counting calories. This is just life and I feel better just knowing what my daughters are eating, and feeling confident that they are going to be healthy. So, one of the changes that we've made in our house is the way we eat. Corrina has been tracking her meals for a week and a half and has done marvelously well. She is really responding to knowing what she's eating, making decisions based on the information she has in front of her. She has made the decision to trade the jelly on her PB&J sandwich (which she MUST take daily) for a drizzle of honey. She is drinking more water and less milk and juice. She has traded her fruit snacks for actual fruit. I know it hasn't been that long and this is only the beginning, but I am amazed by the improvement she has shown and how little resistance she has put up. I am very proud of her. I am in no way affiliated with Chickin Feed. I only came across their product by chance and appreciate that it has helped us. You can check them out at http://chickinfeed.com/. You can also follow them on Twitter and Facebook.